Sorry for posting so much of other peoples' news today, but I found this via LifeHacker and it's going to come in very handy for my own Mother (a college English professor) and several of my old co-workers at that same college. For a long time, I was the go-to-guy for student data recovery, and students seemed to have a knack for really borking their Word Documents, not having any backups, or bringing in files that were created by some un-known word processing suite whose native format couldn't be opened up by any software in the computer labs. Of course, my best friends for this kind of thing were usually dd and strings... not exactly user-friendly enterprise applications. I'm going to e-mail this to my mother and some old co-workers now. I can just imagine the green marks all over this article's epic run-on sentence in the last paragraph. Yes, my mother grades her papers with green ink. Less intimidating than red, she claims. Hi, mom! Love ya lots. 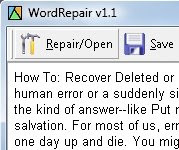 Download Repair My Word for free! Sorry, Windows Only.